Eileen Power (1889-1940) was an economist and medievalist, whose life is well described in a review of a 1996 autobiography here, and by an obituary to be found on JSTOR (you can read the first page, but you’ll need access to read the rest) here. 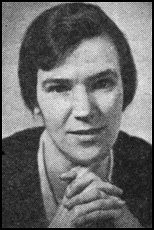 Power was at this time the Professor of Economic History at the London School of Economics, although she probably best known for her books on the medieval world, some for children (co-written with her sister Rhoda, a children’s writer). She was married (after an engagement to Reginald Johnston, the man who tutored ‘The Last Emperor’, Pu Yi) to Michael Postan in 1937, just three years before her death at 51.